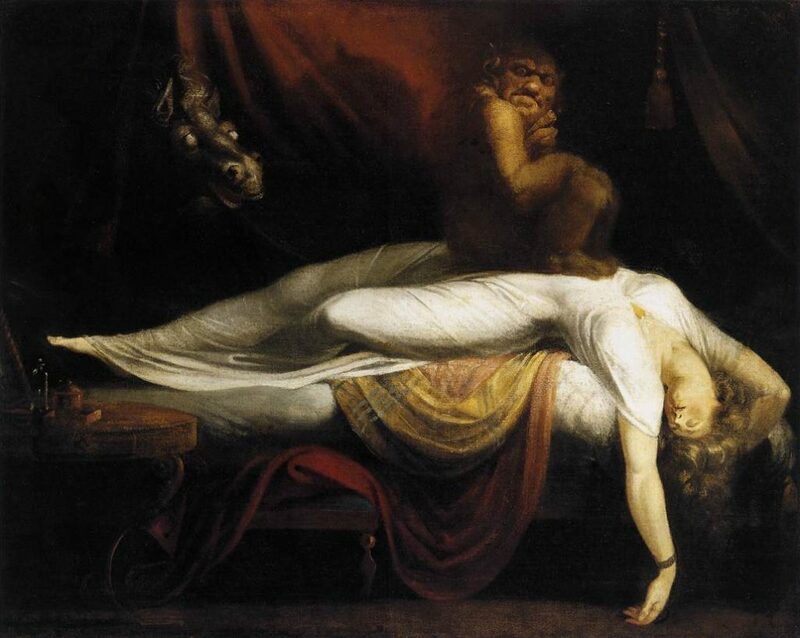 When I first read about sleep paralysis, also known as the Old Hag phenomenon, I was terrified. Thankfully it is more common in people with narcolepsy or anxiety, but the idea is still scary. You wake up, but you are still unable to control your body. You lie there, paralyzed. To make things even worse, the paralysis is often accompanied by terrifying hallucinations often involving a person or creature sitting on your chest. The Nightmare by Henry Fuseli, 1781. Sleep paralysis occurs either when the person remains aware while their body shuts down for REM sleep, or when they become aware before their body has completed the REM cycle. When a person wakes up paralyzed and vulnerable to attack, an emergency response is activated in the brain. The sense of helplessness intensifies the threat response and could account for why the “intruder” is perceived as evil. The explanation behind the pressure on the chest, or incubus, is a combination of the muscle paralysis and the threat response. Breathing during REM sleep is naturally rapid and shallow, unnoticeable while asleep but frightening to those suffering from sleep paralysis, who are suddenly conscious of the shallow breathing and feel as if they are suffocating.